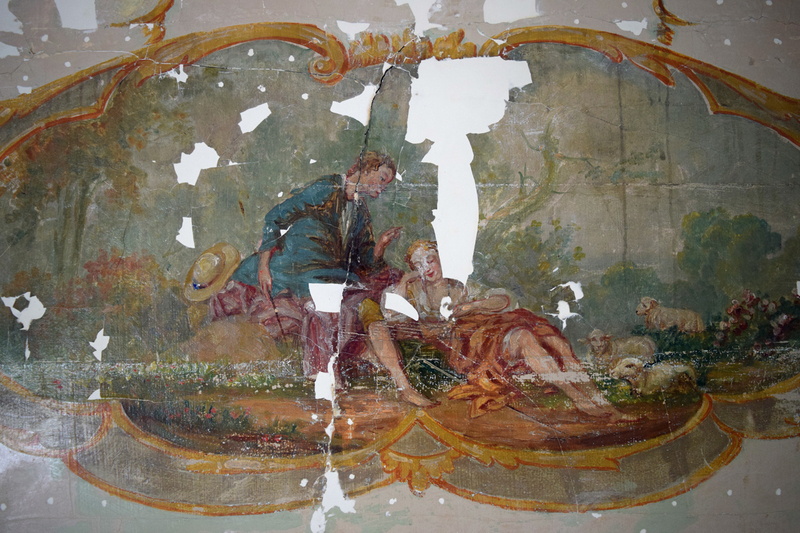 Foreground Conservation was contracted by the Torrington, CT Historical Society to remove over-paint, conserve friable paint layers, stabilize loose plaster, then restore 4 decorative cartouches in a bedroom at the mansion. 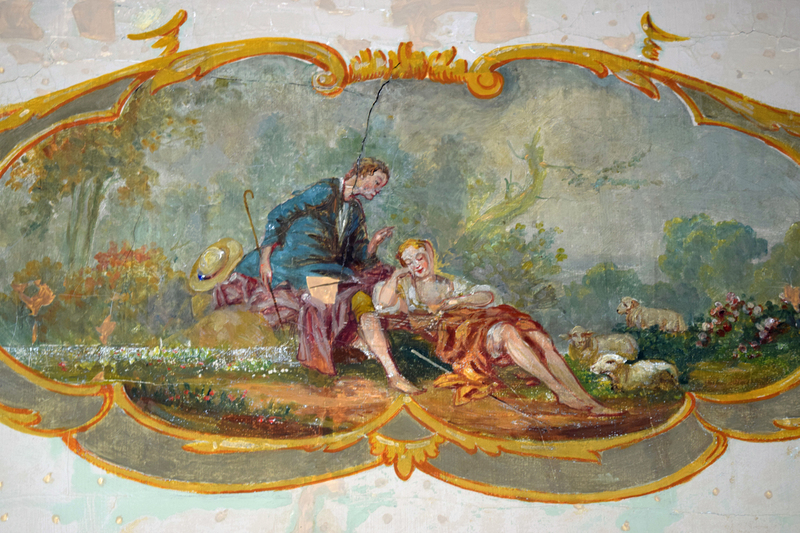 The target paint layer was the 2nd decorative paint campaign in the room, having been executed in the 1930’s or 40’s. 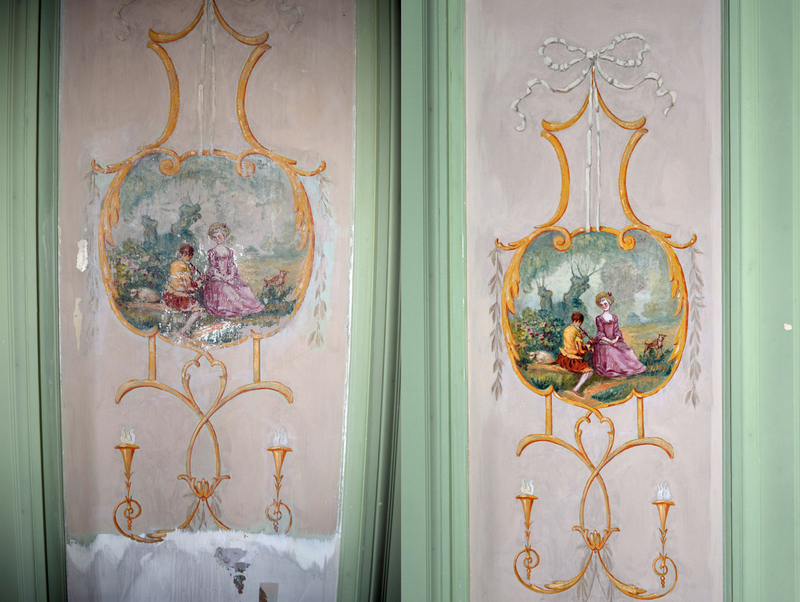 The paint conservation project was part of a larger restoration of the entire room that consists of reproducing missing wallpaper, repainting of walls and trim to historic colors and matching upholstery and drapes to photos of the era of the house’s last occupant- Gertrude Fyler Hotchkiss. This cartouche had remained half exposed due a 1960’s build in that, when removed, revealed the original paint layers. The paint at this location was very dirty and seriously flaking. Foreground used a thermoplastic resin and heated irons to stabilize the failing paint and press the layers back to the plaster substrate. 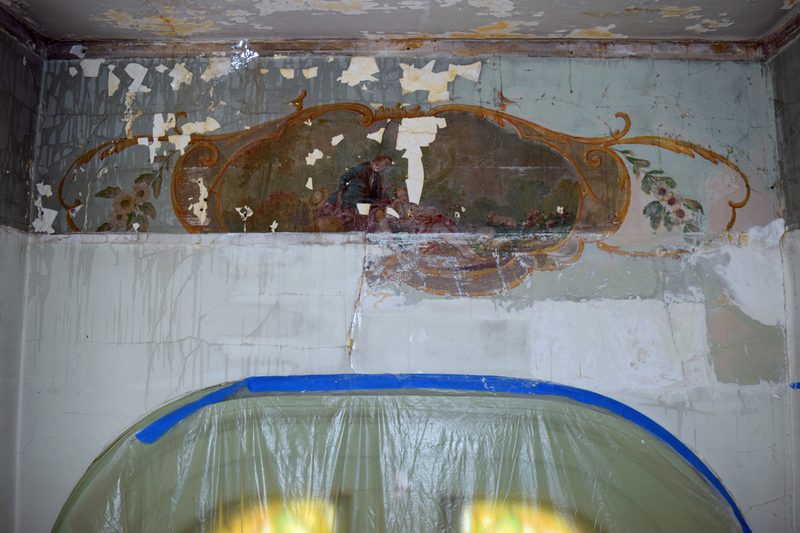 After consolidation of the paint and plaster, the remainder of the cartouche could be revealed through chemical exposure. The methods used were very similar to the larger scale projects we have executed at the Park Avenue Armory in NYC. 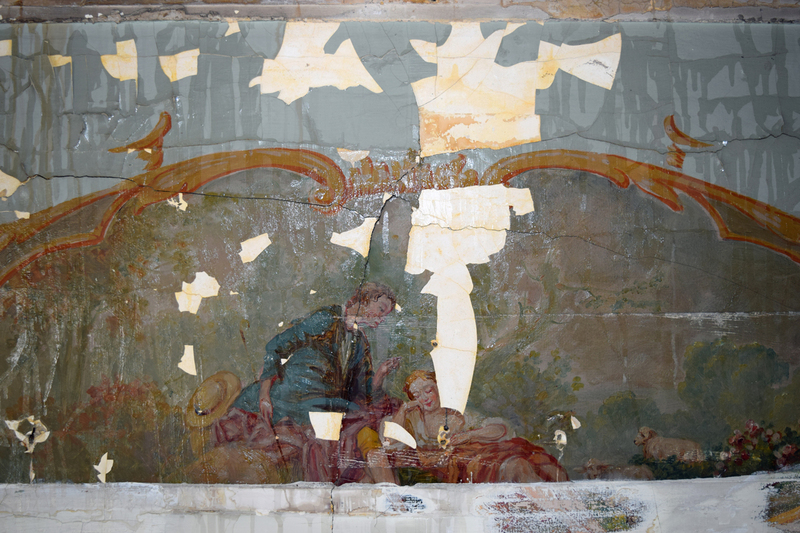 After over-paint removal and cleaning of the paint layers, losses to the plaster substrate were filled flush. Then, losses were inpainted with reversible Restoration paints. 2 of the cartouches had been partially exposed in the 1960’s by a well-meaning restorer. Unfortunately, that intervention resulted in poor exposures and some damage. Foreground revealed the remainder of the decoration and then in-painted the previous damages. 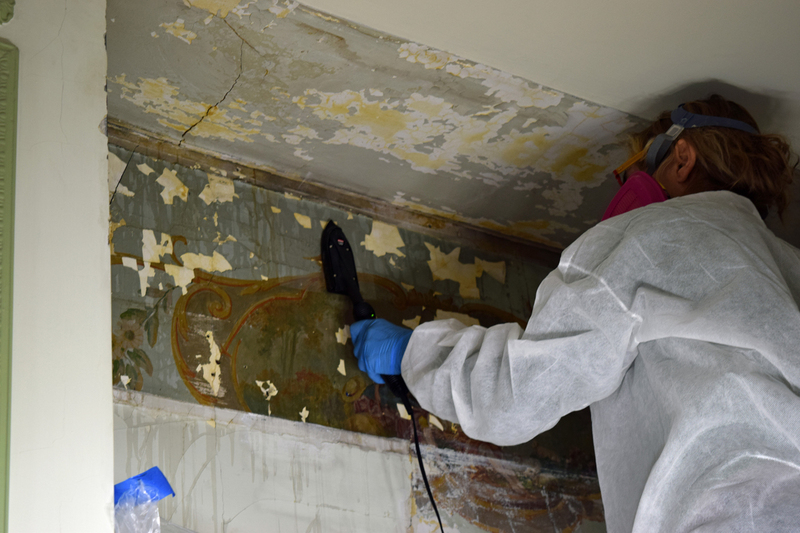 Additionally, Foreground exposed areas of historic architectural paint and provided brush outs of wall, trim and ceiling colors for the Torrington Historical Society’s painters to match.